September is Bee Awareness Month – Hooray for bees! 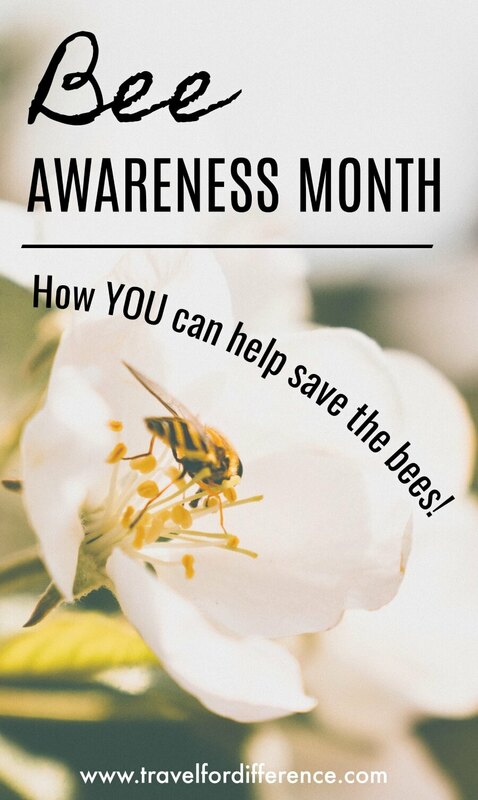 I know we’re already halfway through September, but being kind to bees should be something we strive for throughout every month of the year, so I hope you can let me off the hook! One of the first things that really stuck with me was ‘co-planting’; basically placing local plants into your garden that would attract bees to help pollinate your crop, as well as helping the vegetables themselves to grow. From there, I realized it was Bee Awareness Month, and now I’m totally smitten with these buzzing little critters. 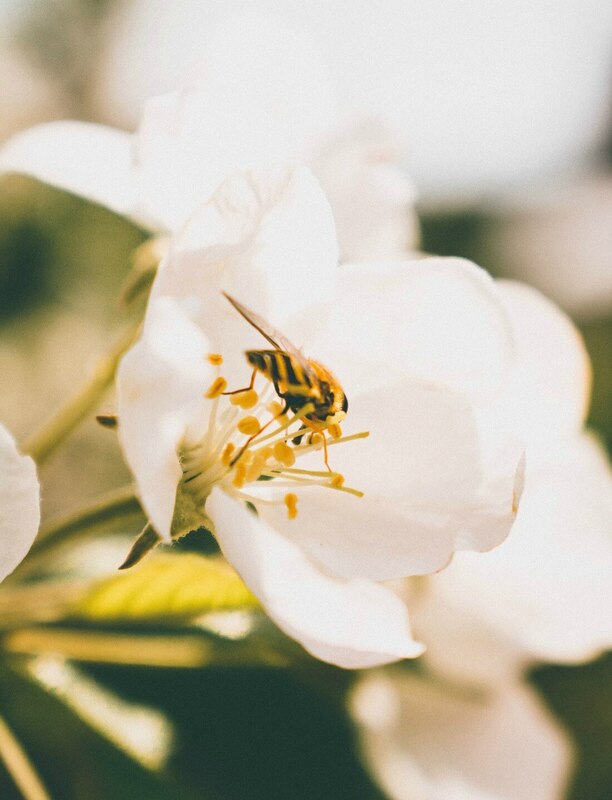 So now that I feel like a true bee expert (I’m obviously not though), I’m now here to give you a little more info on why we should help to save the bees instead of running away in fear (unless you’re allergic… Then I totally sympathize with you)! No bees… Literally no life. Bees are the fastest pollinating insects on the planet, and they are essential in keeping the Earth healthy and thriving. Without them, a huge variety of plants wouldn’t exist – I know that might not sound like a big deal to some, but when so many different species are dependant on these plants for survival, it’s pretty important. And guess what.. Humans are one of them! These little friends pollinate up to 70 of the top 100 human food crops, and it’s said that one out of every three bites of food that humans consume have been pollinated by bees. So if you want to keep surviving, we need to keep the bees surviving too. They may be small, but these tiny little creatures are the hardest workers on this planet. One bee colony can pollinate up to 300 million flowers each day. They keep this beautiful Earth looking luscious and vibrant, so for the simple fact that they’re keeping you and thousands of other species alive, I think it’s time that they receive a little more of our love! WHAT CAN YOU DO TO HELP SAVE THE BEES? There are beekeepers that put the bees first, who truly care about their safety and who strive to do positive things for their future – and the future of the environment. I’m definitely not recommending that we start eating honey with every meal or bathing in it at night, but supporting the people that are striving to increase the bee population and help maintain a healthy environment is very important. Whether you choose to buy honey from a sustainable beekeeper or make a simple donation, that is totally up to you! But supporting the people that are doing good for the future of bees, is doing good for your own future too. 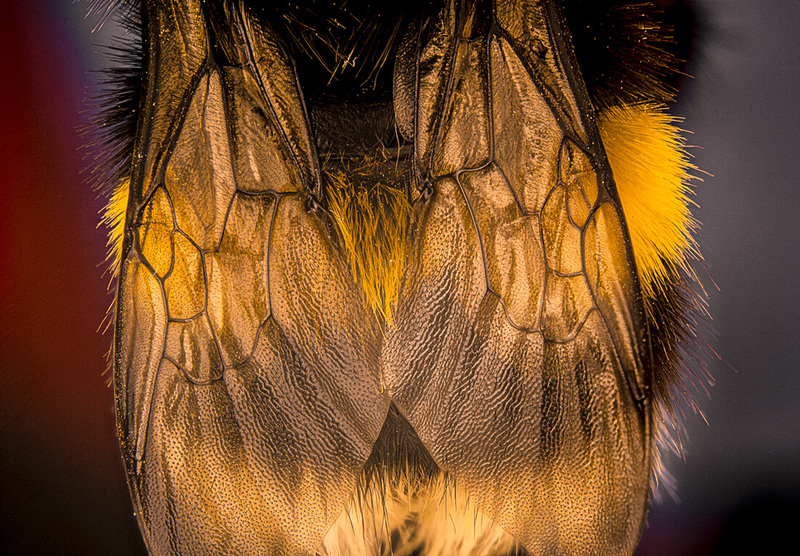 Pesticides, fungicides and herbicides are a recipe for disaster for bees – when they crawl along any plant that has been sprayed with these ingredients, their future is unfortunately very grim. Always read the labels and buy local, organic produce that hasn’t been treated with these nasties. And if you have a garden of your own, avoid these sprays if you can! + Lavender, Rosemary, Bottlebrush, Sage, Tea Tree and Flowering Gums. + If you have a veggie garden – Calendula, Marigolds, Sunflowers, Poached Egg Flowers and a variety of Herbs are amazing alternatives! 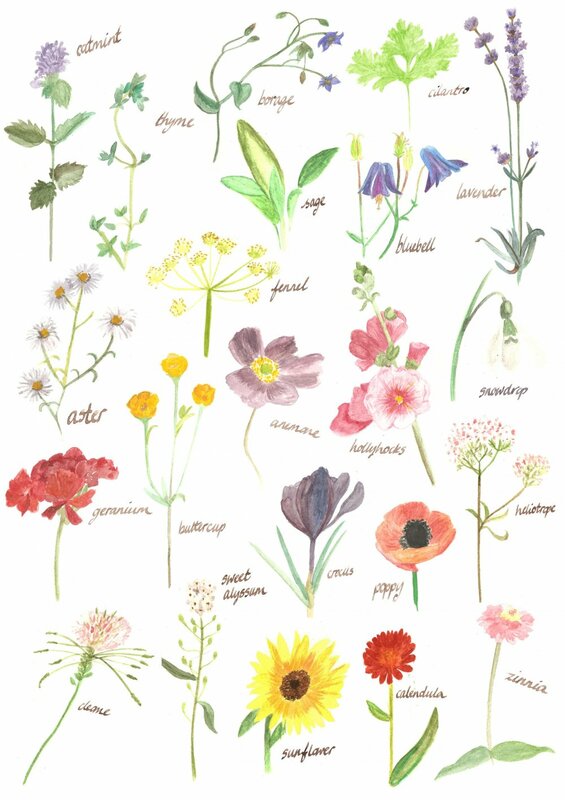 This beautiful artwork ^ by Olivia Hannah is a great reference too! If you can, grow your own fruit and veg! Growing your own produce means that you’re avoiding the products that have been contaminated by the nasty chemicals I mentioned above. You’ll have peace in knowing that you’re eating organic, homegrown food where absolutely no bees have been harmed! Even if you don’t have a garden, giving the bees a place to stop for a drink can save their lives! Grab a bucket of water and float a big supply of corks in it – this will give the bees a landing pad and a place to stand while they drink. Alternatively, you can get a shallow bowl and put some rocks in it for them to stand on, but make sure the rocks haven’t been contaminated with any pesticides. Super easy, but the bees will be very grateful! If you ever find a bee that seems to be a bit sluggish and unwell, give it a sugar solution of 1 part sugar, to 1 part water. Put a few drops onto a hard surface, or leave the solution on a spoon and hope that the bee will drink. But never give them honey! They don’t want to hurt you and they certainly don’t want to intentionally sting you. They are gentle in nature and only strive to collect pollen from flowers to take back to their hive. They may land on you and give you a sniff, but they will only sting you if they sense fear… So stay calm! They will only get in your way if you get in theirs. They like to hang around your food and are quite aggressive predators. Their bodies are slender and shiny in appearance and can often attack unexpectedly. They eat other insects and are important in the sense that they control the insect population. Although they may look quite similar, bees and wasps are actually totally different! Take the time to research the beautiful things that bees do for YOU, and for the place that you call home. Once you truly discover how important they are, you’ll no longer be wanting to kill every one that you see! Please, please, PLEASE don’t hurt them! If you get a bee in your home, don’t go straight to the bug spray… Use a glass to trap and release them outside. I very much understand the fear, especially for those with allergies, but if you have the ability to save them without risking your life and your health… Please do! Have you got any other tips to help Save the Bees during Bee Awareness Month (and every other month of the year)? I see no bees where I live. What should i do?